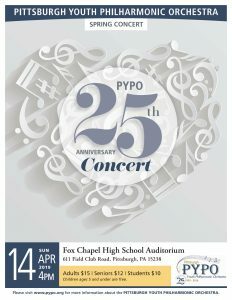 Join the musicians of the Pittsburgh Youth Philharmonic Orchestra in celebrating our 25th season! Member of PYPO’s Philharmonic Orchestra, Prelude Strings, Prelude Band, Overture Strings and Overture Band will perform works by Shostakovich, Elgar, Robert W. Smith, and Khachaturian as well as many others. For more information on PYPO, please visit www.PYPO.org.